THE WRITING BUDDHA - Opinions | Books | Movies: What Steve Harvey taught us that night!!! Recently, an incident took place at Miss World Competition when the host ended up announcing the wrong winner and almost after 4 minutes of whole procession of crowning the winner, he came back on the stage and told about the error he did of announcing the wrong name. Every got shocked at the stadium and on Live TV. Few people appreciated it with claps while others started booing him. Initially, I did laugh at him but later on, when I imagined myself at his position, I realized how much time I must have taken to go back on the stage and tell it in front of the millions about the mistake I did at one of the most responsible position of one of the biggest events in the world. Hosting is never an easy job, I know. I have myself been at that position for around 6-7 times in my life. I can understand what it takes to stand on the stage and do the job which is more spontaneous than programmed. The biggest thing that the host taught the world that night was how big yet easy job it is to accept our mistake in front of everyone. He didn't care about audience booing him just after announcing his mistake. He didn't care the number of trolls that he'll have to face for few weeks online. He didn't care about losing many important opportunities in future as many important people must be watching that telecast. He simply took charge of the situation, brought himself into the control and did what 99.99% of the people would have failed to accept it. 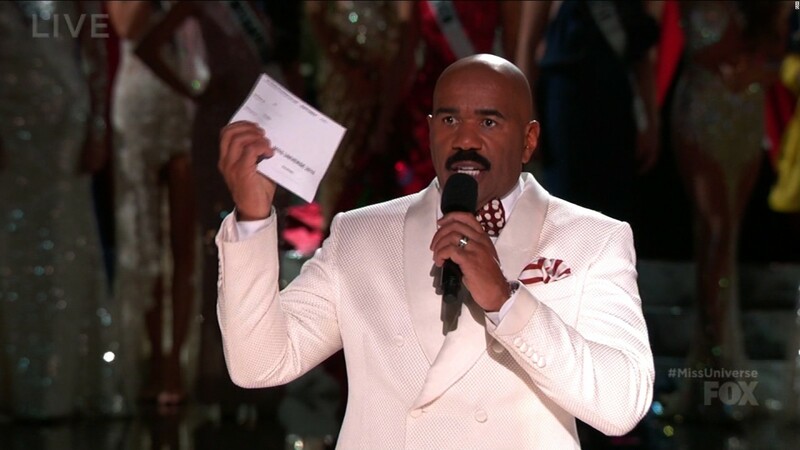 Well done, Steve Harvey! There are many times we see during sports that a team after losing blame almost everything but not itself. They blame pitches. They blame crowds. They blame overseas condition. They blame their board committee. But they hardly declare that they were enough inefficient to win that match. And this leads to many more loses in row and the team keeps losing their momentum and a time comes when a newcomer team starts defeating them. And then there are teams that openly talk about their mistakes on the field, accept their mistakes during those important minutes and move on ahead to not repeat the same in future. We should learn to be like Steve Harvey and the latter team I talked about. We should not feel ashamed of accepting our mistake and declaring it in front of everyone before someone finds it and investigates us in public. Before the bigger embarrassment comes before us, we should realize the importance of sharing our faults with others. Yes, it does take guts to do but it starts helping us within few minutes. People start coming forward to help us and assure that we are out of the trap and the same mistake never gets repeated by us in life. Either its organization, home, native place or public place, people react with shocked faces initially but gradually, the very same people understand your position and comes forward.